Roll-down screens have been around forever. Most of us remember them from third grade, when the teacher broke out the projector to show educational films. The least expensive home theater screens can be manually rolled down, although most are automated. Automated roll-down screens allow a clean installation of a large video screen that can disappear into the ceiling in seconds. It is not uncommon to see non-dedicated theater rooms, such as living rooms, where installers put in a large-format HDTV, such as a plasma or LCD, for daytime viewing and a front projector HDTV for nighttime movie magic. 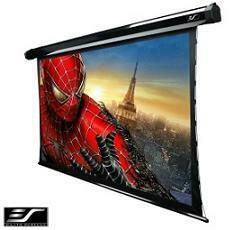 You can get roll-down screens from companies like Stewart, SI Screens, Da-Lite, and Elite. Before you decide on a screen material, make sure you check out this article on screen gain.